Fixed deposits schemes are the most commonly opted for tax saving instruments mainly by salaried persons. Fixed deposit schemes offer security and higher returns as compared to regular saving schemes.Fixed deposit schemes allow people to invest money for a stated period of time post which a fixed rate has to be paid until the end of the deposit period. 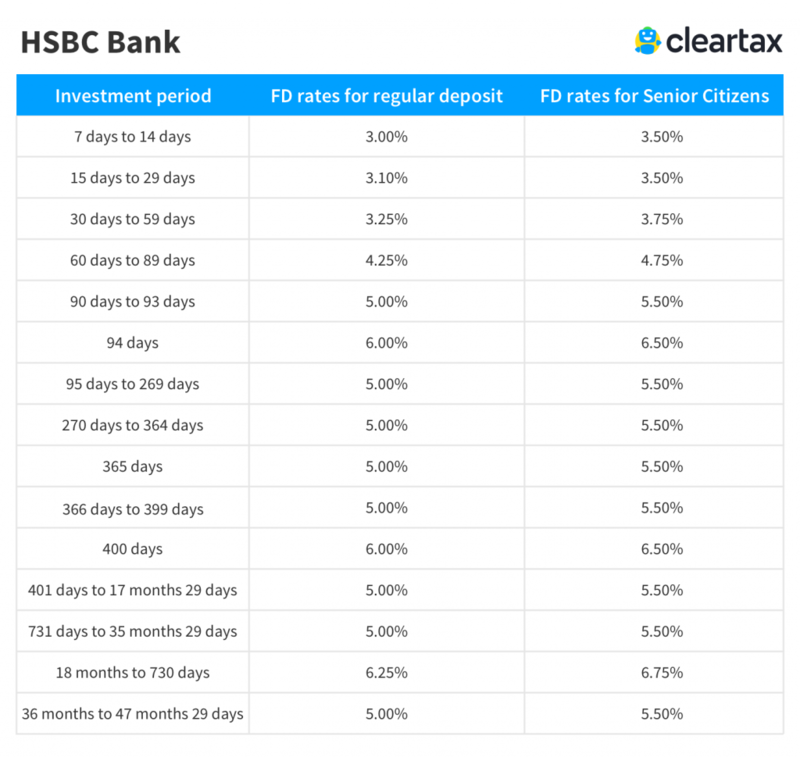 HSBC Bank’s fixed deposit scheme offers great returns at the end of tenure. Deposits can be made for a period of 15 days to 4 years. HSBC Bank offers Smart Money Accounts, Fixed deposit accounts, and Senior Citizen Fixed Deposit. The minimum amount required to open this deposit scheme is Rs 10,000. Competitive interest rates are offered against all FD schemes. NRE NRO and FCNR deposit facility is available. The account can be opened easily through online and offline modes. HSBC Bank FD: Is it the best way to save? Fixed deposit schemes offer security and higher returns as compared to regular saving schemes over a deposit period and hence are a preferred investment instrument for many. Banks offer competitive interest rates with a variety of lock-in periods catering to the needs of a wide range of investors. However low risks equal low returns as well. HSBC bank allows premature withdrawals of deposit, however, a predetermined penalty will be levied in such a case. 1% penalty rate is applicable on premature withdrawal of fixed deposits. The depositor earns 1% lesser rate compared to the existing interest rate decided during scheme selection. HSBC Bank has a tax saving option with deposit tenure of 5 years. Individuals, minors, and HUFs are eligible for this. Investments ranging from Rs 100 to 1.5 Lakh can be made. However, it is important to note here that in case of fixed deposits, the tax levied is dependent on the tax bracket you fall into irrespective of FD tenure. If the interest earned on your fixed deposit is more than Rs 10,000, TDS deduction of 10% would be deducted by the bank. Mutual funds have an edge over fixed deposit in this regards as tax payable on mutual funds depends on the category. For example, long-term equity funds (more than 1 year) are tax exempt.They offer a higher capital appreciation potential and a smaller lock-in period of 3 years. Hence we can say investing in Mutual funds is viable tax saving option. Fixed/Short Term Deposit– A standard FD scheme offered by HSBC bank wherein customers are paid fixed interest amounts at regular intervals.